Letter to St. Nick | Break It And Learn! Shimi, this is what I’m talking about. I was 9 years old – in 4th grade – and pretty greedy! Hopefully the “clothers” was a Houston Chronicle typo and not my error! I wonder if my dear IIe still works… My first exposure to computers… Gertrude’s Puzzles and Gertrudes Secrets! And of course, my favorite, Math Blaster!!! And then I remember being jealous when the Apple IIgs’s came out! I called him St. Nick! Everyone else called him Santa! “Sincerely”??? “Loves” and “Your friends” from everyone else! I hope I can blame my stilted prose on being in ESL in second grade. But this was fourth grade! Hm, can I use the same excuse for my still-stilted prose??? Mom felt so bad when she just reread this a few days ago – the part about my clothes being too small! I guess she didn’t realize back then! Those stickers? I hoarded them and saved them and loved them – tacky as they were – and now they aren’t sticky anymore! Plus, I wouldn’t want to use them anyways if they were! Trash can, hello! And I still don’t have the Disney Channel! And I’ve never had cable. Santa, haven’t I been a good girl? How ’bout HGTV this Christmas? I don’t need the Disney Channel anymore! And of course, “Every good and perfect gift is from above” (James 1:17), and not from Santa. Hey! 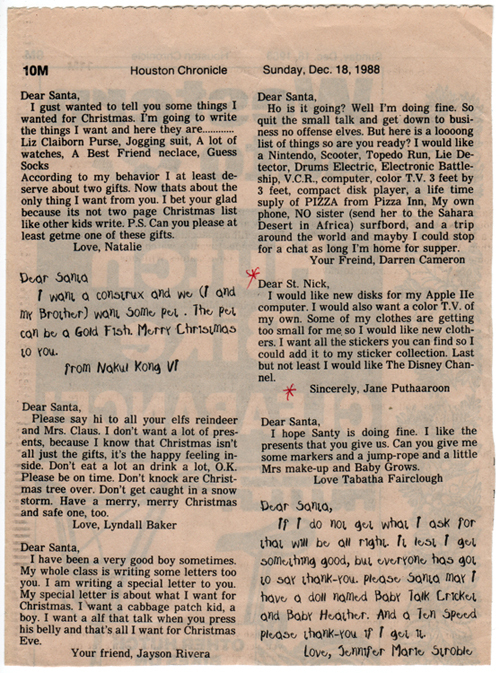 I found your post from the “random” tag link. . .I wrote a letter to Santa in 4th grade but I didn’t ask for any presents. . .I just grilled him about his home life. I asked things like, “How is Mrs. Santa? Is your relationship okay?” and “Do you have kids and if so, how do you treat them? Do you use them as elves?” I was concerned with other, bigger, nosier things when I was in 2nd grade, apparently. Anyway, enjoyed your post! Upon reading this wonderful blog entry by Jane Puthaaroon, it has come to my attention that perhaps we could collaborate on a fantastic project. The objective is an arrangement where you help provide me with a color printer scanner all-in-one device, and in return I can try to scan in some charming old photos which we have taken together (circa 1985) so that you can see them on your computer and save them for all eternity. I hope your cash flow is such that you can manage a small expenditure at this time of year, as it is almost exactly halfway to next Christmas. I also would like some new violin strings, a new computer/school bag (perhaps jack spade or manhattan portage? ), and an extra dose of will power so I can get down to 108 lbs, my target weight.